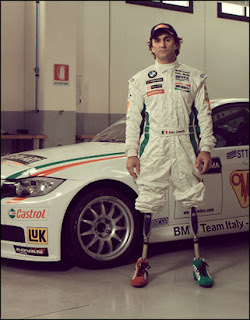 Alessandro (“Alex”) Zanardi wishes to have never happened, as he nearly lost his life! Along with both of his legs and most likely causing Alex Tagliani to suffer nightmares of an out of control spinning racecar careening directly into his path! Thus it was even more impressive that during his return, not only did he climb back into an Indy Car, Alex incredulously ripped-off a top lap speed of 194mph+, which would have qualified him fifth for the days event! Yet, the amazingly energetic and joyful Italian has since gone on to drive a BMW-Sauber F1 car along with currently competing in the FIA World Touring Car Championship, (WTCC) continuing to win races for Team BMW Italy-Spain, run by ROAL Motorsport and most recently claiming the Czech Republic’s first round on June 21st. Not to mention his ever improving competitiveness in Hand-bike racing, of which Zanardi finished 4th in the ’07 New York Marathon, basically on a dare!